In Charlottesville’s prolific restaurant scene, it is increasingly difficult for new entries to stand out. 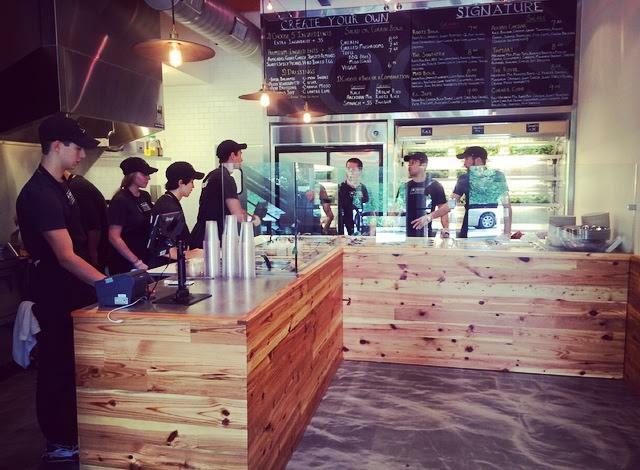 Take Charlottesville’s newest restaurant, Roots Natural Kitchen, which opened yesterday on The Corner. Natural ingredients . . . yeah-yeah-yeah . . . health-conscious food . . . blah-blah-blah . . . affordable and fast . . . yada-yada-yada . . . Andrew Silver and Ivan Rekosh . . . Wait, WHAT? Andrew Silver and Ivan Rekosh?! As chef-owners of ZoCaLo, Silver and Rekosh have run one of the most consistent kitchens in town for more than a decade. Their devotion to excellence is so fervid that no one has managed to lure them from their singular purpose at ZoCaLo, our first ever entrant into The Charlottesville 29. So, what was different about Roots Natural Kitchen? To answer that, it helps to understand the restaurant’s origins. Roots began last year as an idea of two friends, one then a student at UVa’s McIntire School of Commerce and the other a 2013 UVa graduate working at Capital One. 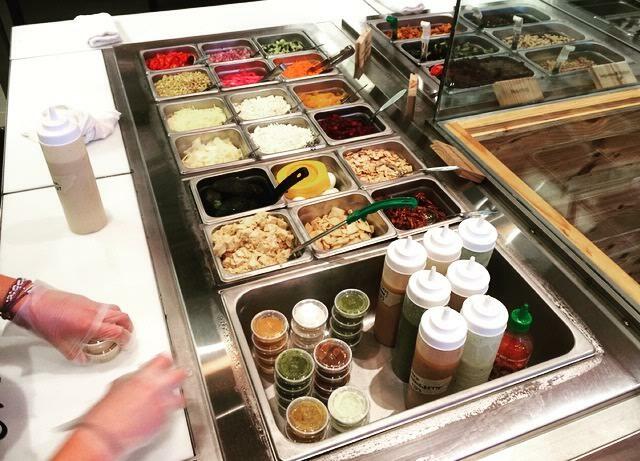 The idea was to fill a niche that they thought The Corner lacked: “healthy food in a fast casual setting.” The two friends, Alvaro Anspach and Alberto Namnum, formed a business plan that attracted other founding investors, including UVa graduate Jung Kim; Joseph Linzon, a classmate of Anspach’s at McIntire who already has his own company; and Paul Gannon, an accomplished investor who discovered Roots while judging a McIntire entrepreneurial competition called The Galant Challenge. The team crunched numbers, estimated market size, and did other stuff business people do. But, they soon realized that, while their team had a wealth of business acumen, they had no experience in actually running a restaurant or creating recipes. So, they did what any savvy businessmen would do: they called in the experts. And, in Charlottesville, there are few bigger experts than Silver and Rekosh. Though it took some coaxing, Silver and Rekosh eventually signed on as chef consultants. “What struck me and Ivan,” said Silver, “was their passion and desire to empower people through food and their commitment to making their food as affordable as possible.” While Rekosh and Silver do not actually prepare Roots’ food, the recipes are theirs. “We strived to create healthy recipes that have high flavor impact, while being extremely easy to duplicate,” said Silver. 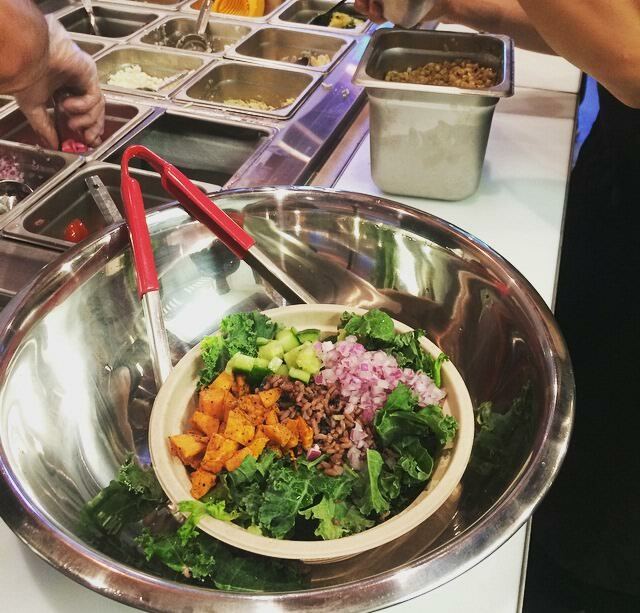 Alternatively, customers can select one of the “Signatures.” Among the grain bowls, Silver’s personal favorite is the Mad Bowl ($8) – brown rice, spinach, mushrooms, roasted broccoli, red onions, grape tomatoes, shredded parmesan, basil balsamic dressing, and pesto vinaigrette. 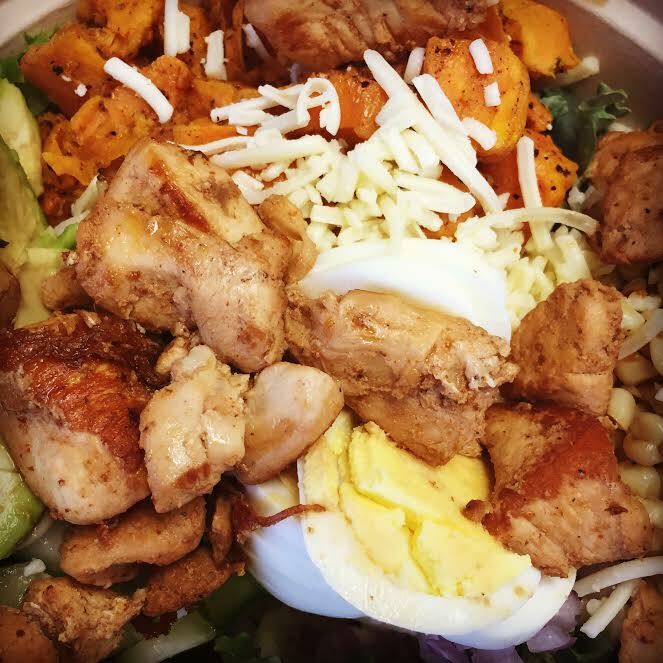 His favorite salad, meanwhile, is The Corner Cobb ($9) – kale and Arcadian mix, roots rice, chicken, sweet potatoes, white corn, red onions, cucumbers, white cheddar, hard-boiled egg, avocado, and feta dressing. We tried one – a very satisfying lunch. Roots is open daily from 11 am to 8 pm, at 1329 W. Main St., which has been home to many restaurants over the years, like Little India, Kabab & Curry, Semolina, Pacino’s Deli, and even a branch of Sylvia’s Pizza. Despite its failed predecessors, Roots seems well located to serve students, faculty, hospital workers, and others seeking a healthy meal on The Corner. Below is the full menu, a few images, and a thought-provoking look into makings of Roots, through the words of co-founder Anspach. There is a key moment in the story of Roots Natural Kitchen where our approach to food, nutrition, and this concept as a whole critically changed. We as a team started reading a lot about food and it struck us how powerful food itself was. We’ve come to internalize and really believe that food is the most powerful substance on the planet. As a result, people should use it to their advantage. We started to understand that we could empower people, specifically through food, and help people exercise more control over their lives. By eating three natural meals a day, meaning foods that are nutrient dense, you have more energy, your mood is improved, you sleep better, and you feel amazing. This happens very quickly. The results are tangible and you notice the outcome. We were amazed at how focusing on our diets improved all of these things I’ve just listed. By improving mood, energy, sleep, and how you feel you have spillovers across your entire life, which allow you to be more social, happier, and more productive. This all ultimately leads to becoming more successful. We were overwhelmed with excitement and so we reengineered this concept so it would be available and accessible to everyone. The way we went about doing that was borrowing from entrepreneurial titan Elon Musk who said, “I didn’t set out to build the best electric car. I set out to build the best car, that just so happens to be electric.” That was a huge insight for us. We realized that our lifestyle and our goals for Roots Natural Kitchen weren’t sustainable or realistic if people were justifying eating there because it was healthy. So we focused incredibly hard on making the food first and foremost 1) delicious 2) affordable 3) satisfying and oh, it happens to be healthy for you. Ivan and Andrew made number 1 possible, with their expertise and collaboration we have developed great tasting natural foods. To achieve number 2 we had to rigorously examine our cost models, continuously fine tune them, and extensively work with our suppliers at Cavalier Produce to make affordability a reality. We think for a one store concept, we’ve been very successful in making our concept affordable. We’ve always been a company driven by delivering as much value as possible to our customer and because vegetables are naturally nutrient dense and calorically low we had to focus hard on making sure our customers were getting great serving sizes of our foods. This would allow them to feel more satisfied and receive more nutrients per meal. Lastly, all of the food at Roots Natural Kitchen has satisfied our requirements for being a food that will deliver a lot of value to people’s lives. Our ultimate goal with Roots Natural Kitchen is to create a place that extends beyond a restaurant. We don’t see Roots as a place where you eat and then forget about until you’re hungry again. If we succeed, we want to be able to deliver values to people’s lives in many ways. By connecting them to information about food (nutrients consumed) and showing them how to make eating and fitness decisions we can correct a lot of misinformation and start to show people how focusing on food can help them better achieve their goals. Right now we are starting by pledging to donate to the Children’s Hospital . . . We’ve gone to speak at the GoGirls program as well, to shed some light on Roots Natural Kitchen and the nutritional foundation upon which we built the concept. We’d love to sit down with local nutritionists, sports experts, and other people who are active in the discussion about food because we think there is a really exciting collaboration out there on how to impact people through food.